I bought a package of Shimmer Sheetz by Elizabeth Craft Designs when Patty and Traci and I went on our stamping "field trip" recently. Patty was in love with these sheets and I thought I would give it a try and it was PINK! I had an idea in my head and wanted to see if it would work. I made a file in my Gypsy for the front of the card to be cut on the the Shimmer Sheetz. 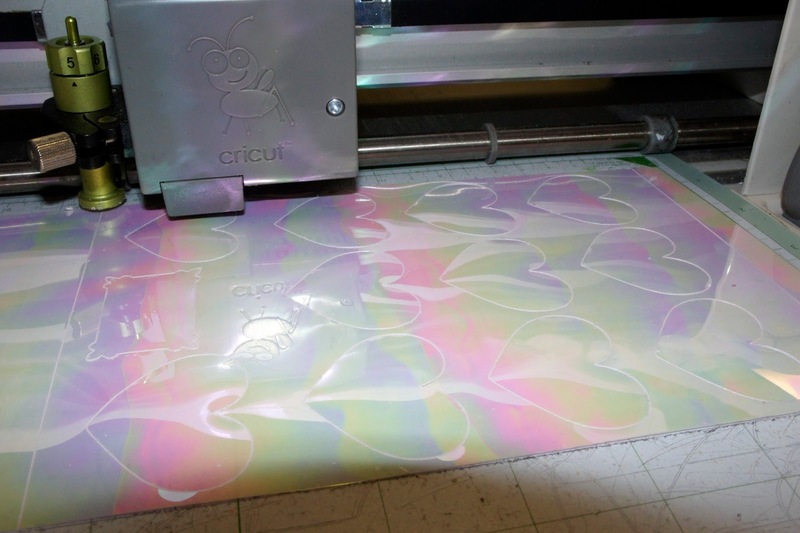 It is a mylar--sort of like a thick transparency. I used a multi-cut of 3. 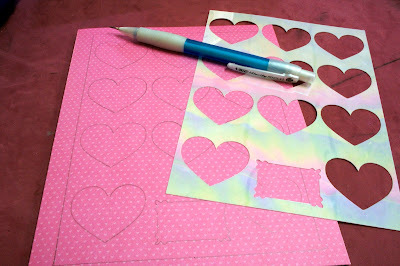 As you can see, I cut hearts and a journaling spot out and was using the negative. The hearts will have a home on another project. 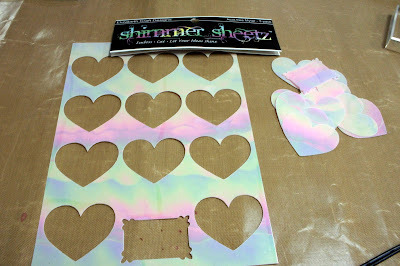 The next step was to trace the hearts onto the paper that would lay underneath the Shimmer Sheetz. I ended up using another pattern of paper in the end, but did it the exact same way. 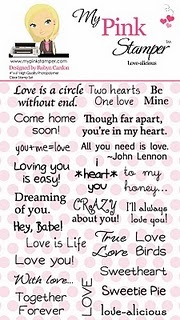 My next idea--use every stamp on the Love-alicious stamp set! 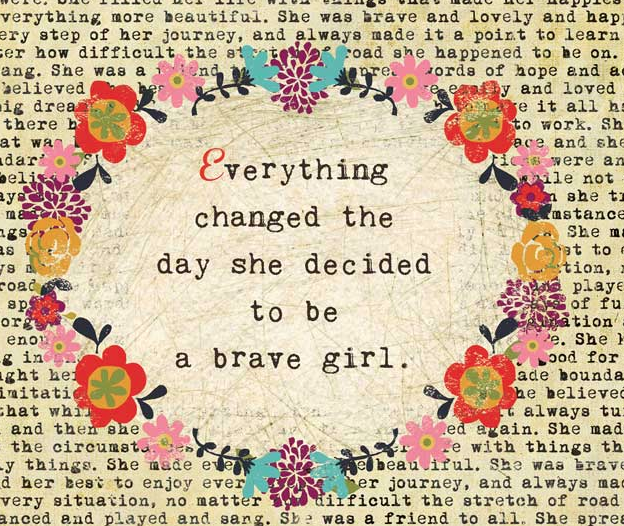 And...I did! I masked off each heart I had traced with scrap paper. 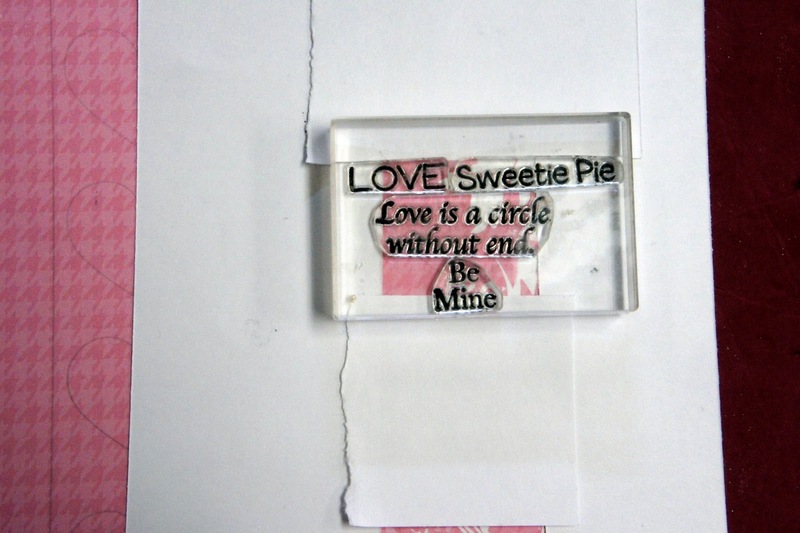 Added random stamps to a block and stamped over each individual heart. This is what it looked like when that part was done. Quite the mess, wouldn't you say? But not for long! The Shimmer Sheetz was added back onto and I really loved the look! I stamped and embossed the sentiment, also from the set, added some ribbon, a pin and used a Martha Stewart Hearts punch along the side of the card. 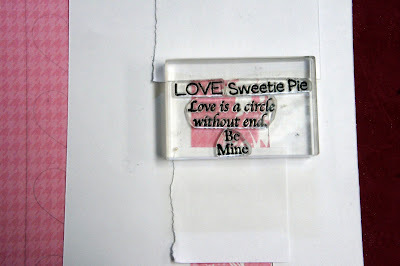 In honor of this being our first Design Team post of 2011 I am giving away, to one lucky person, My Pink Stamper's Love-alicious Stamp Set. All you have to do is leave a comment by Wendesday, January 26th @ 10pm Central Time. Please leave your contact information with your comment in case you are the one!! I will pick a lucky winner with a random generator. Maria, this is soooo beautiful!!! I love how you used every single stamp in the set. You are so creative!! Maria, this is just awesome!! Everything you do is so unique. So inspiring! Wow! Such an amazing project. It shows all the details when you see all the stamps you used in it. Wow, I love this idea.. soo cute and simple!!! Came over from Pink Stamper, loved your card, first & best in my opinion. Love your blog. Your card is absolutely gorgeous! I am new to your blog...but will be a follower from now on! Congrats on making the team...wouldn't have found you if it weren't for Robyn. Can't wait to see what you create next & THANK YOU for the chance to win! I love your card. It is so cute. 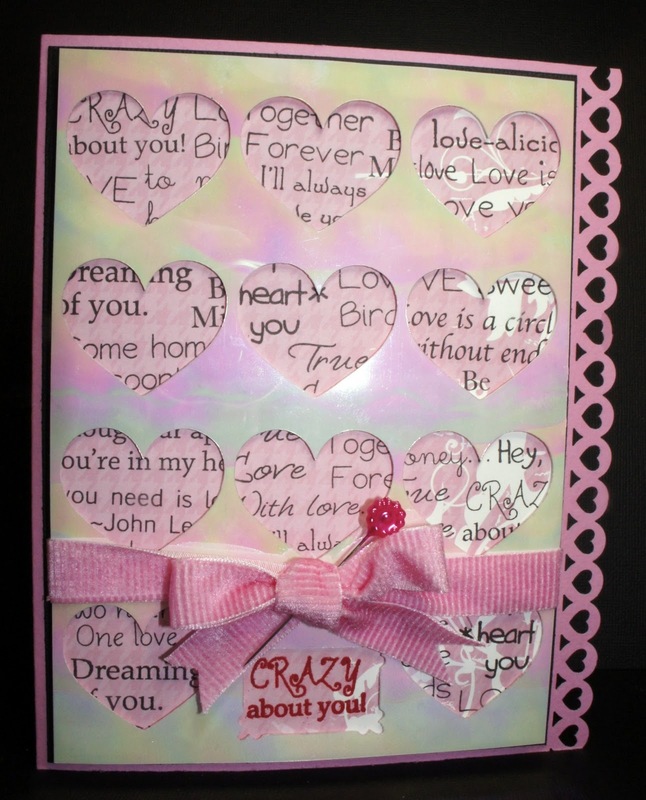 Beautiful card, I love how you used all of the stamps from the Lovealicious stamp set. 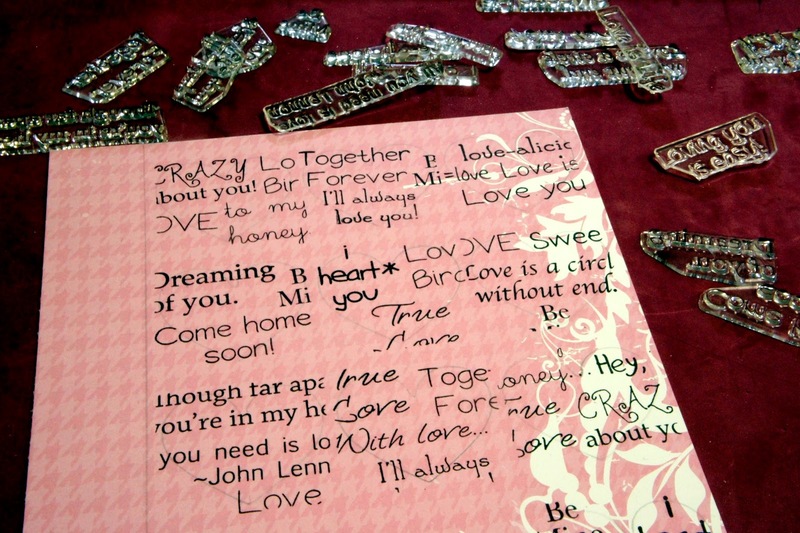 Maria, very beautiful, who wouldn’t want to receive a card like this,very creative. This absolutely gorgeous! I love it! Thank you for sharing your talent. Maria I love your card! When I first saw it this morning I didn't realize the stamped background. Then when I looked again, all I can say is WOW. That must have taken some time w/ some awesome results. Love it! Maria, I just love your card. What an awesome technique. I love that you sudes ALL of the stamps. Thanks for sharing so much detail. Great card. What a fabulous technique! Love it! Love this! I may have to try this technique one day! TFS. This is so unique! I love this card. This is awesome! I love how you used the negative space for the card front. HOW CREATIVE! I LOVE YOUR CARD! I MUST SAY THIS IS THE BEST IDEA I HAVE SEEN YET! THANKS FOR SHARING! This is such a cute idea! Love it. Thanks for sharing and thanks for the opportunity to win! Love your card. Thanks for all the great work you do. Love this idea! Thank you for sharing it. Look forward to many more creative ideas from Robyn and "her team". You card is so cute. Gotta get the creative juices flowing and start on my husbands vday card. TFS your work with us! Love how you see the text through the heart shapes. 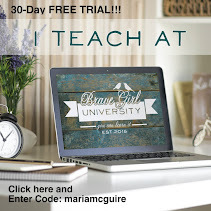 Maria - I just signed up to follow you! This is so awesome...I hope you don't mind if I scaplift it!!! :0) Awesome jo! 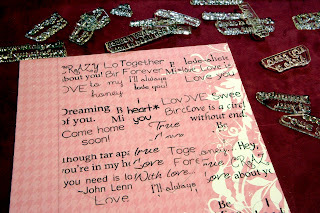 I love the idea I am going to try it on my valentine cards. You did such a great job. Love this!! Very unique. You did an excellent job!! I love the way you were able to use every stamp from the set. It turned out awesome! TFS! Very Pretty!! LOVE the peek-a-boo effect! i LOVE LOVE LOVE this card!! i so want to try this. I dont yet have the stamp set, so would love to win!! great idea!!! What a great idea - I love love love it. Wow, I've never heard of the shimmer sheetz - they're really cool. Great tutorial and beautiful card! This is too fabulous! Waay to use your stamps! You are so super creative! And I have never seen shimmer sheetz (WANT) WOW thanks for sharing some great techniques! Fabulous card! Thank you for the step by step! Fantastic card! Thank you for the how to! WOW, how creative!!! I love your card so much. Such a neat idea! I never would have thought of something like that! Thanks for the chance to win! how creative ! I love it ! How creative yo plan this card! Beautiful. Oh my I love this card! I'm going to have to try this soon!! Loved your card. Such great ideas. Neat idea! :) Thanks for sharing! Your card is gorgeous! I love the pink colors and the use of the Shimmer Sheetz. I've never heard of this product before but now I have to buy some. LOL. Thank you for sharing your creativity with us. 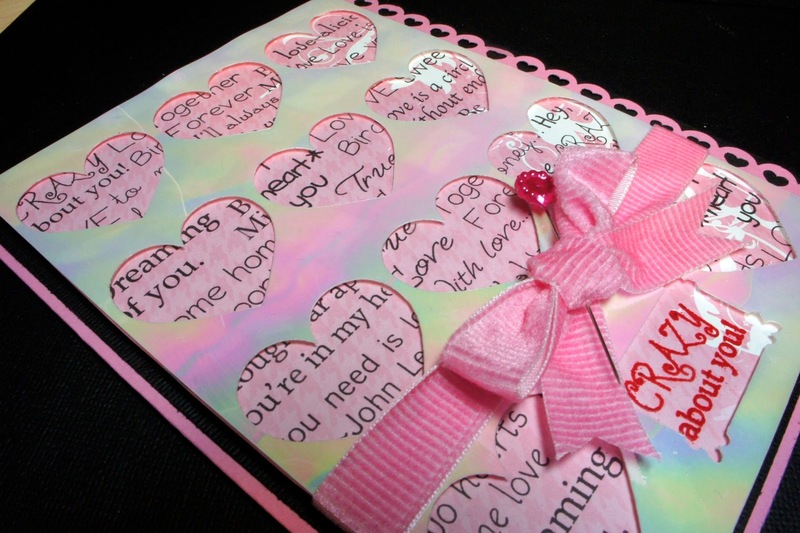 Your shimmer sheet idea is amazing - I absolutely love it!!! I am going to have to go on a shimmer sheet hunt!! Thanks for the inspiration!! Thanks for sharing and thanks for the chance to win the stamps. great project! i love the detailing you did with the stamps! This is such an interesting technique. It came out beautiful. I will be trying this soon! Love the heart cut-outs, I would love to try this with vellum paper. This is really pretty! I love that shimmer paper. Thanks for sharing! Really nice card great design. 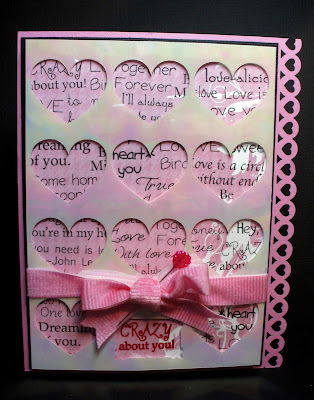 Great way to incorporate all the stamps into one card. cute card! I was wondering how you did that! Love it.....Love it....Great idea...Thanks for sharing. I love the shimmer sheets, and how you totally thought outside of the box on how to make a card! Fantastic, thanks for the great share and I'm a new follower! I'd love if you have time to check me out too! Thank you again! Very clever and such a cute idea. What a neat effect. Congrats for making Robyn's DT. I am a new follower. Cute project. I just might try that, its looks so cute!! Lovely card and so creative with the stamps. Hoping the creativity will rub off on me by studying your blog. Beautiful work. Beautiful card! I love your idea! This is such a beautiful card.... I love how you did this!!! Wow! What a great, creative idea!! That looks so cool. Great way to get the most out of all the cute stamps too! Love it!! Wow! What a beautiful card and what great ideas you have shared. Love that shimmer paper too...now I have to try to search for it. In fact, I think I'm going to head off to my workshop right now as you have inspired me once again to try something new. Maria what a pretty card & a terrific idea! Love it. You did a great job. Thanks for the inspiration & for the chance to win. Your team is all so creative. Thanks for the opportunity to get these stamps! You did an awesome job. This was my very very favorite card of all. So very creative. Good job.